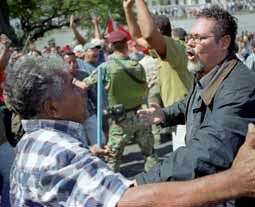 Chávez ally and (then) National Assembly member Juan Barreto rallies supporters around Miraflores. Photo by Gabriel Osorio. Following are select pictures from the photo gallery. News that the march was going to Miraflores spread quickly over the airwaves. Every TV station in the country, except the official government channel, VTV, was covering the march live. Surrounding Miraflores was a contingent of National Guard troops as well asseveral hundred loyal Chávez supporters. Many of these supporters were members of the local community groups known as Circulos Bolivarianos, or Bolivarian Circles. Circle members had been on permanent guard duty around the palace since Sunday and had set up a stage in the middle of the street for speeches and music. The creation of the Bolivarian Circles was one of the most controversial aspects of the Chávez regime. The opposition claimed they were paramilitary units that Chávez used to do his dirty work, while the government claimed they were harmless community groups. The truth was somewhere in between. While most of the Bolivarian Circles were exactly what they said they were—groups of party members organizing to better their community and spread the word of the revolution—there were other Circles that were modeled after the Dignity Battalions—the local militias used by General Omar Torríjos and Manuel Noriega in Panama—that had impressed Chávez when he was a military attaché there. Many Bolivarian Circles received military training and arms, and some of their leaders were sent to Cuba for training. Some of these Circles were now congregated around the palace too. It would take several hours for the march to travel the five miles from Chuao to the palace, and the loyalists were using the time to get ready. Rallying the supporters with a megaphone was National Assembly Deputy Juan Barreto, a member of Chávez’s party and a close ally of the president. Doctor Alicia Valdez, fifty-two, a small, raven-haired accountant, was in her office near Miraflores when she began to see groups of people moving down the street toward the palace. Having heard that the march had illegally changed its scheduled route, she knew that these were loyalists going to defend the president. Both Alicia and her sister, Florangel, worked for the Chávez administration, her sister as a counselor in Miraflores and Alicia as a notary—an important political position in Venezuela because all official documents had to be authenticated by a certified government officer. Neither Alicia nor Florangel had been involved in politics before Chávez because they had become disenchanted with the corrupt two-party system. But the more Alicia learned about Chavez, the more she liked what he was offering, especially his recognition of the poor. Eventually she and her sister became staunch believers in the movement. As Alicia sat at her desk and tried to focus on her pile of papers, she found herself looking out the window over and over again to see what was going on. Finally, she gave up. She couldn’t concentrate. When someone in the office said that the people in the street were armed, she and her friend Mariela decided to go investigate. What they found was that some people were armed, but with umbrellas and sticks, and they told Alicia and Mariela that, all the same, if the march tried to get to Chávez, they would defend him with whatever they had. Now that Alicia was down in the street, it seemed as if everybody was going to the palace. She and Mariela knew they couldn’t miss this, and, besides, how were they supposed to get any work done with all this going on? They started toward Miraflores.